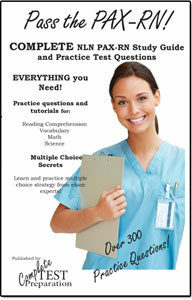 The Complete Guide to Test Preparation - Everything you need to know! 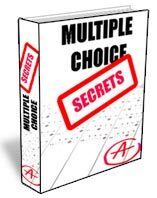 > Discover 15 secret strategies that will raise your score on any multiple choice exam regardless of the subject. When faced with an exam most students hide their heads and procrastinate hoping that somehow they will be spared the agony of taking a test – particularly a big one that their future relies on. Avoiding the all important test is what many students do best and unfortunately they suffer the consequences because of lack of preparation. Test preparation requires strategy. And it requires a dedication to get the job done. It is the perfect training for anyone planning a business career or any professional or life endeavor. Besides strategy you must have a goal and know what you are trying to accomplish. These tried and true concepts have worked well and will make your test preparation easier. Standardized tests are by far the most common type of test. They are called “standardized” because every student must answer the same questions. This allows teachers to establish the progress of each student compared to the rest. The great advantage of this kind of tests is that it can be adapted to any subject or theme (math, science, arts, etc). Standardized tests are usually multiple choice, often with an essay questions and sometimes with a few open-ended questions. Each problem has a one answer and any other is incorrect, and each correct answer has an exact credit. This allows for rapid marking and most standardized test have now migrated o computer assisted tests. Reading comprehension is generally a component of standardized tests in High School, College Entrance and English as a Second Language (ESL) tests. Reading comprehension appears on a huge variety of standardized tests because it is an ability that’s important for all the areas of knowledge. This is the capacity to analyze the content of a text, understand its main idea, infer the meaning of words, draw conclusions and other skills common in everyday life. Reading comprehension tests generally present the student with a passage, and multiple choice questions based on the passage. Self-testing or self-assessment are valuable tools for students to assess their strengths and weaknesses ahead of a test. Most Study Guides have a self-assessment section, as well as commercially available sets of practice tests, old tests, or DIY tests. Mathematics is always a special case that generates fear in students. Constant practice is the most effective way to fixate information, so it should be a big part of this study routine. Entrance tests are designed to determine if a student has the right profile (academic and personal) to attend the institution. These tests that have different goals; some are oriented to assess the previous knowledge of the individual and readiness for the next level, others are to diagnose the academic abilities and the areas of great achievement of the student, and stillk others are to find out if the student would be capable of adapting to the regulations on the institute. Private schools have their inner rules and principles, and these tests not only determine if the student can be part of the institution, but also becomes part of a diagnostic teacher use to know the student better and define the best approach for him. So, it’s not just a selection process. These tests help maintain the academic profile in the institution. Ask the instructor what will be on the exam. The teacher might tell you or might not but it is worth a try. Keep any tests that are returned especially those with comments made on them and they make excellent review materials when studying and more than likely some of the same questions will be on the final test. Pay attention in class. Listen to what is said. Often a teacher will tell you that a particular area will be on the test or reference things that might be there. A study guide put out by the teacher offers a lot of information that might be on a test so keep these guides and it will likely be data that you can anticipate will be on a test. Listen to teacher’s clues to test questions that are often things like: questions that have been asked of the class or if the teacher has repeated something several times. Take note of these clues. Take responsibility for your own test preparation. Don’t rely on others. It is your job to be prepared for the test. Don’t allow others to distract you from your goals. Prioritize to maximize your time available to study. Figure out the best times or spaces of time that are open for you when you can be the most productive. Try to consolidate activities to allow you longer periods of study time. More on How to Concentrate. Find a quiet place where you won’t be disturbed. It could be the library or the park or someplace else as long as you ensure there are no interruptions so that you can truly concentrate. Good lighting is essential also and you need to be comfortable. However, getting comfortable on your bed is not recommended as you will fall asleep which is the last thing you should be doing during study time. Determine what exactly you need to study. Gather together your books, your notes, your laptop and any other materials needed to focus on your study for this exam. Ensure you have everything together you need or know where to get anything missing. Perhaps a trip to the library will be necessary or some online research. Have a positive attitude. It is essential that you approach your studies for the test with an attitude that says you will pass it. And pass it with flying colors! This is one of the most important keys to successful study strategy. Every Subject is different – different subjects require a different approach. Organize all your materials so that they are easy to review and access. If you can consolidate them without having to rely on too many study materials, it will be easier. Find out what kind of test you will take. Review your notes you have taken in class and the assignments that have been given, especially any comments that have been made by the teacher. If there is a study guide it will be a valuable tool to use for studying. Estimate how much time you will need to thoroughly study everything for the exam. If you are concerned about the amount of time you have available then set up a schedule so that you don’t get bogged down on one section and not have enough time left to study everything. Allow for all activities including exercise or whatever stress reducing strategies you use. Test yourself to determine what your weak spots are. If there are online tests available that you can use then do so. Review any tests you have already taken on the material and see what problem areas you have. Once you have determined any areas of concern, you will be able to focus on those and just brush up on the other areas of the exam. Manage your time effectively. This is a key to success as you need to give yourself the time you need to study all the material without interference from anyone else! Maintain your schedule that you developed ensuring that all other activities Don’t interfere with your study time. Relieve stress and try to relax. Use whatever works best for you to relieve the stress – yoga, journaling, or exercise – but these cannot take time away from your studying schedule – rather they should be integrated with that schedule. Breathing Exercises for Test Anxiety, How to Handle Test Anxiety. Eat a healthy meal before the exam. As indicated above it is important that your stress level stay low the day of the exam so avoid foods that will accelerate your stress rather than relieve it. Have confidence in yourself! Everyone experiences some anxiety when taking a test, but exhibiting a positive attitude will do wonders at making you have less anxiety and be better prepared for taking the examination. This is your opportunity to show how well prepared you are! Ensure you have everything with you that will be needed for the test. 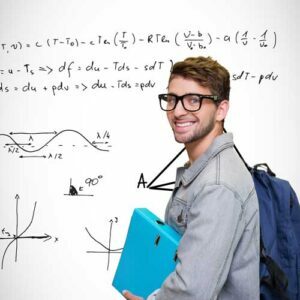 Depending on the exam, you may be allowed to have a pen or pencil, calculator, dictionary or scratch paper with you. Have this gathered together along with your entrance paperwork so that you are sure you have everything that is needed. Arrive early for the test. Allow yourself plenty of time for traffic so that you Don’t have any delays on getting to the test area. Never arrive late to the test. Don’t chitchat with friends. Take a seat and get comfortable. If other students are worried their anxiety could be detrimental to you. Maintain your confidence. If you are feeling anxious, take several deep breaths and continue to do that slowly until your anxiety lessens. 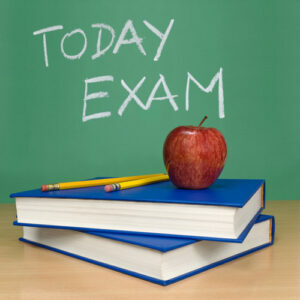 Remember that you are well prepared and have the ability to pass the test with no difficulty. Listen to the instructor to see if there are any time changes or other instructions that you need to be aware of. Answer easy questions first. If you get stuck on a question, skip it and go back to it later. Don’t get bogged down on one. Sometimes the answer will come to you later. Use strategy with difficult questions. If it is a multiple choice question, you should eliminate the answers that you know to be wrong. If you still have difficulty finding the answer, then use your best guess. Don’t leave any question unanswered. It is better to be wrong than not to answer a question and you could be lucky and get the question right! Review your test before you leave to ensure that you have answered every question. Also make sure that you have not mistakenly answered a question twice or mis-marked an answer. Any of these mistakes can cost you. Proof your answers for grammar, punctuation or spelling errors. Absolute words – like never, none, always, every and entirely – usually imply that the statement must be true 100% of the time so it is usually a false answer. Every part of a sentence must be true to make the answer true. Negatives are very confusing so if a question uses ‘no,’ ‘not’ or ‘cannot’ then you should take those negative words out of the sentence and see what it says and you can determine whether it is indeed true or false. Qualifiers open up or restrict statements – words like often, sometimes, frequently, generally or ordinarily hint at accurate statements and usually indicate true answers. Long sentences with words set off by punctuation should be looked at to find the truth of the phrases which usually indicates a false answer. 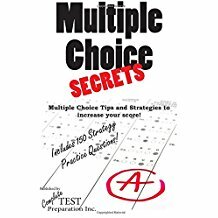 Multiple Choice Tests – This type of question is often a phrase that has several options available for the answer. Question those options that grammatically Don’t fit with the phrase. Question those options that contain negative or absolute words – substitute a word like frequently to always to see if it eliminates the option. All of the above questions can trip you up but if you know that two out of three seem to be correct, then it is probable that all of the above is the right answer. If there are opposite options available then probably one of them is correct. Most Standardized Tests, and All High School Tests, College Entrance Exams and Nursing Entrance Tests are multiple choice. Short Answer Tests – This type of question usually tests your fundamental knowledge of a subject. Focus on key words and eliminate those that do not deal directly with the question asked and respond directly. Use concise answers with short sentences containing key facts. Be brief and succinct in describing your response. A guess is better than no response. Don’t leave the question blank as usually your common sense will give you the answer required. 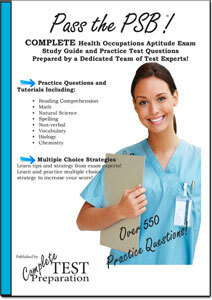 Open Book Exams – These tests will evaluate your overall understanding of the material. These tests can vary by teacher as to what is allowed in class during the exam but could include books, notes or class assignments. Be familiar with your notes and materials available for this test. You need to have everything well organized so that you can easily retrieve it when needed during the exam. Use of sticky notes or color coding will help to keep track of summaries, headings or sections that might be needed during the test. Use quotations to illustrate a point whenever possible. Be concise and do not drag out the answers with long complex sentences. Use good time management to ensure you complete the exam and Don’t get stuck on a question that you can’t find the answer to. Essay Exams – These tests not only test how much you know in a certain subject but also determine your ability to explain the answers or arguments for them. Read a question thoroughly to see how it is phrased to ensure you understand what is asked for. State your main point in the first sentence and then provide specific examples or supporting information. Develop each point and qualify your answers when you are unsure. Summarize your central idea in the last paragraph and state whey it is important. If you follow these easy to use guidelines you will improve your strategy for test preparation and will successfully breeze through your next examinations! Nice points. I will surely share these with my children. My boy has a problem with multiple choice exams. write a litte more on this topic? I’d be very grateful if you could elaborate a little bit further. Bless you! Really good recommendations for test preparation strategy. It was very helpful. Keep Posting! Thanks for the tips on preparing for a test, it can be a stressful event so any tips help. I agree that one of the best things you can do for yourself when taking a test is to have confidence in yourself , it can make all the difference when you get there. From my point of view, being timid when it comes to test time can waste your time and your brain power.